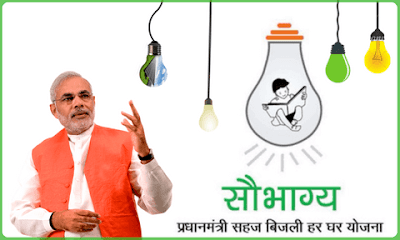 Objective To provide electrification to all households in the country. To be completed by 31st of December 2018. The Prime Minister Shri Narendra Modi has launched a new scheme on September 25, 2017-Pradhan Mantri Sahaj Bijli Har Ghar Yojana –“Saubhagya” to ensure electrification of all willing households in the country in rural as well as urban areas. The total cost of the project is Rs. 16, 320 crore while the Gross Budgetary Support (GBS) is Rs. 12,320 crore. The Government of India will mostly provide the funds for the Scheme to all States/UTs. The States and Union Territories are expected to complete the works of household electrification by the 31st of December 2018. The beneficiaries for free electricity connections shall be identified using Socio Economic and Caste Census (SECC) 2011 data. Un-electrified households that are not covered under the SECC data would also be provided electricity connections under the scheme on payment of Rs. 500 which shall be recovered by DISCOMs( Electricity Distribution Companies) in 10 instalments through electricity bill. It also includes the Repair and Maintenance (R&M) for 5 years. For easy & accelerated implementation of the Scheme , modern technology shall be used for household survey by using Mobile App. Beneficiaries would be identified and their application for electricity connection along with the photograph of the applicant and identity proof shall be registered. The Gram Panchayat/Public institutions in the rural areas are to be authorised to collect application forms along with complete documentation, distribute bills and collect revenue in consultation with the Panchayat Raj Institutions and Urban Local Bodies.